For generations, being interested in science made you an outcast—forced into the depths of basement laboratories, backyard telescopes, and dusty library sections. But over time, popular science started to break through to the masses, with shows like Mr. Wizard, Beakman’s World, and Bill Nye the Science Guy. The last decade in particular has seen a science boom in what is cool, thanks in large part to Mythbusters on television and Vsauce on the interwebs. So in some ways, it’s only natural that hosts from these two programs would team up for a joint science stage show: Brain Candy Live. Minneapolis was lucky enough to be one of the early tour stops on December 3, 2017, with the show coming to the legendary Orpheum. 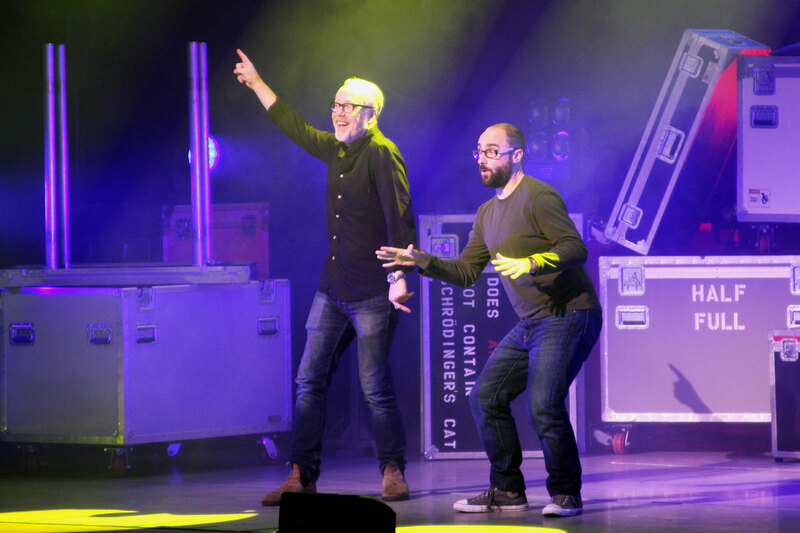 Adam Savage and Michael Stevens are fun performers who are genuinely interested in entertaining and educating their audience. Adam handled the dad jokes, Michael tackled the puns, and they both provided the science. The first segment was mostly about that most essential of substances, water. Our hosts set up a number of different mini experiments while detailing the history of science and the minds who brought us this knowledge. Did you know smoke machines and stage foggers aren’t creating smoke or even water vapor? I sure didn’t. What we see are just very small water molecules. (Mind blown.) These examples culminated with an impressive display using a giant air cannon to fire rings into the audience. Even at the age of 35, this made me audibly ooh and ahh! The intermission provided time for the audience to tweet questions to Michael and Adam for them to answer after the break. While this geek wasn’t lucky enough to have his question answered, there were plenty from the audience addressed. 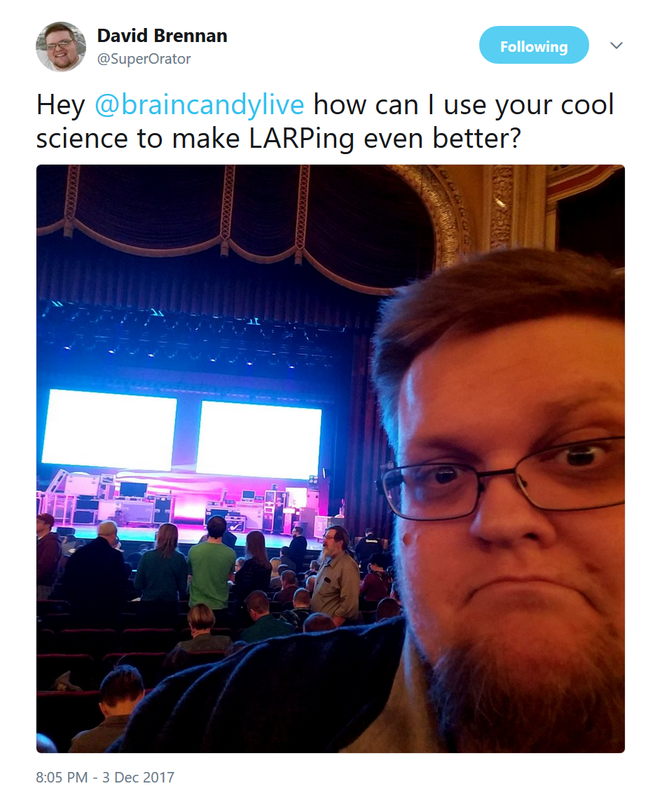 Adam got to talk about a few exciting moments from his Mythbusters past, and Michael answered questions about science and his favorite part of Minneapolis. (Hint: it’s a certain hat-tossing statue.) 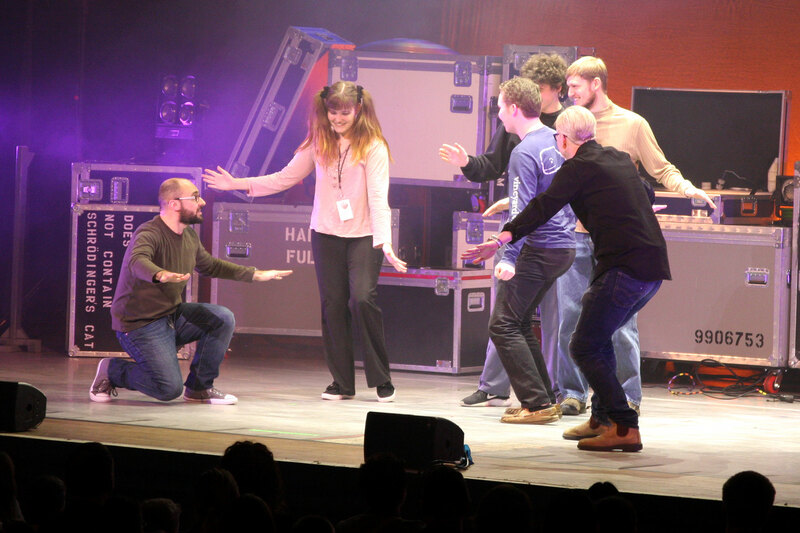 The experiments continued with the physics of air and how it moves and interacts all around us, culminating with hundreds of ping-pong balls flying into the audience. Audience members tweeted their questions to the hosts. A major benefit of a show like this is that it’s super family friendly. The audience was filled with kids and teens, some of whom were lucky enough to be called onstage to participate in some of the bits. A few did different dances to simulate the actions of different elements, one young girl helped build and ride her own hovercraft, and a boy raced Adam to fill a bag with air (and won, with science). If you’re seeing this show at a later stop, I’d avoid the first dozen rows if your little ones are sound sensitive; science can be noisy, especially when a ping-pong ball fires out of a plastic tube at 360 miles an hour . . . before it’s supposed to! One of the more touching moments was when Adam told a story about learning to juggle as a child. His father made animations for Sesame Street for a couple months each year so he could spend the rest of his time painting. Adam didn’t come from any sort of riches, but he loved to learn and create, eventually being able to make his own juggling pins. He detailed this whole story while he made another pin, which he then tried to get Michael to juggle. It gave the aspiring science nerds a real sense of hope and belonging, knowing they could commit to their passions with some hard work and creativity. As I left the theater, I heard multiple kids exclaiming to their parents about the experiments they wanted to try at home. 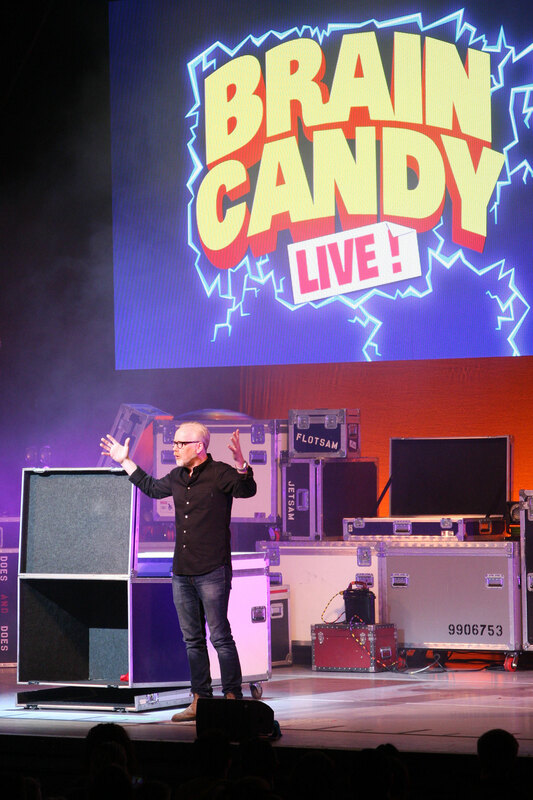 Brain Candy Live is touring the US, Canada, and Australia through May 2018, and Midwesterners who missed the Minneapolis performance will have another chance when the show hits up Madison, Wisconsin on March 22. 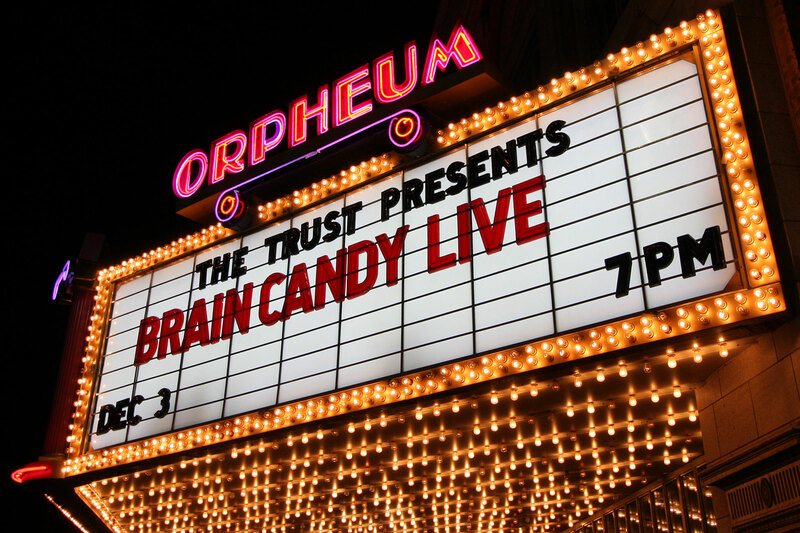 The rest of the dates and locations can be found on the Brain Candy website. If you know any science enthusiasts or pretty much any kid who wants to be entertained, send them the info!